Trip Tips to make your Colorado vacation smooth and enjoyable. Daily Snow Report is Copper Mountain's official daily snow and mountain operations report. Frisco, Colorado Weather report is the closest weather station to Copper Mountain 6 miles away. CO Trip.org is a website by the Colorado Department of Transportation. It shows traffic cameras along the I-70 corridor and will also tell you when there are road closures. Go I-70 for real-time I-70 traffic updates. Our concierge service, High Country Activities, offers custom vacation planning, with bookings for transportation, winter and summer activities, and guest services including ski rentals, lift ticket advice, grocery delivery, catering and event planning, wedding assistance, and family reunion coordination. Call Jane at 970-389-8214. Whole Foods Market - Grocery store offering natural and organic foods. Bakery, meat counter, pastery counter, deli, buffets, pizza. Located off I-70 in Frisco behind Safeway. City Market - Large grocery store with bakery, deli, meat counter, pharmacy & Starbucks. Located in the Dillon Ridge Shopping Center, 300 Dillon Ridge Road, Dillon CO 80435. 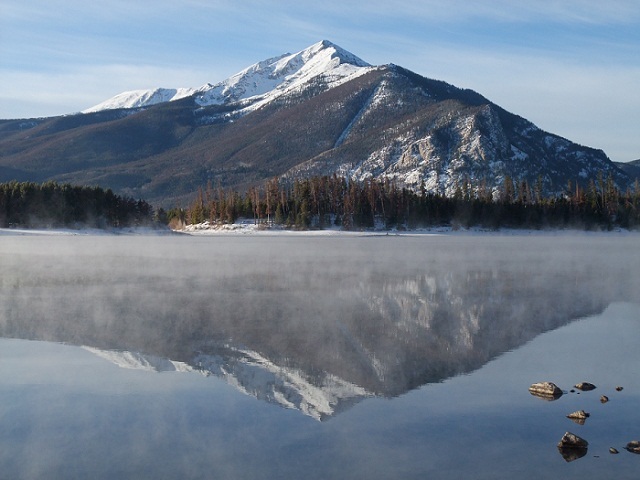 (15 minutes from Copper Mountain). Vitamin Cottage - Organic food market located across from Safeway in Frisco. Target Store Grocery - Located inside the Target store at 715 Blue River Parkway, Silverthorne CO 80498. (15 minutes from Copper Mountain). The Mobile Chef - For travelers ready to truly relax on their vacation, this personal chef service will prepare and serve a terrific meal right on site! MARKETAXI - Premium grocery delivery service. Expert shoppers will select the highest quality products from Whole Foods Market according to your specifications. Copper Mountain Center Village offers a variety of shops including mountain clothing and accessories, boutiques, souvenirs and more. 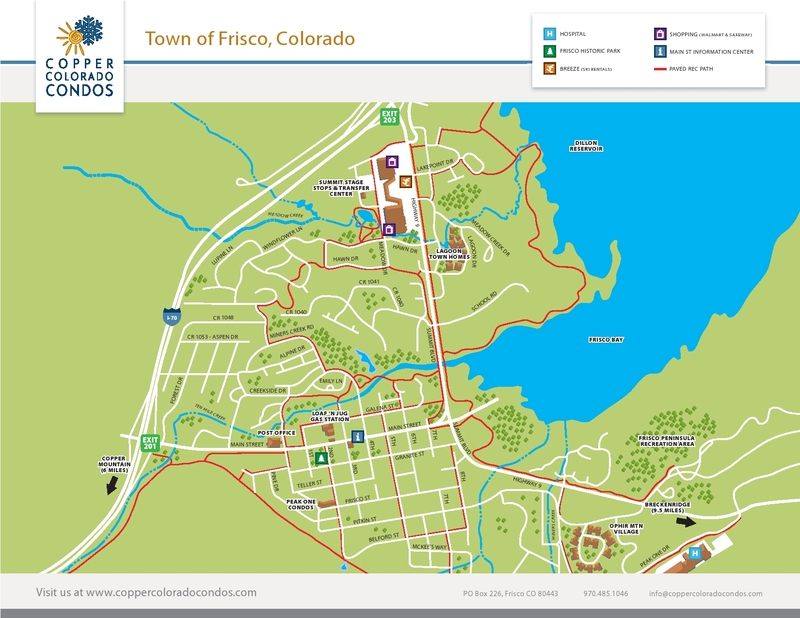 Frisco Main Street is a shopper's paradise with a plethora of shops lining Main Street. The Towns of Breckenridge, Silverthorne, Dillon and Keystone Ski Resort have their own brand of shopping experience. 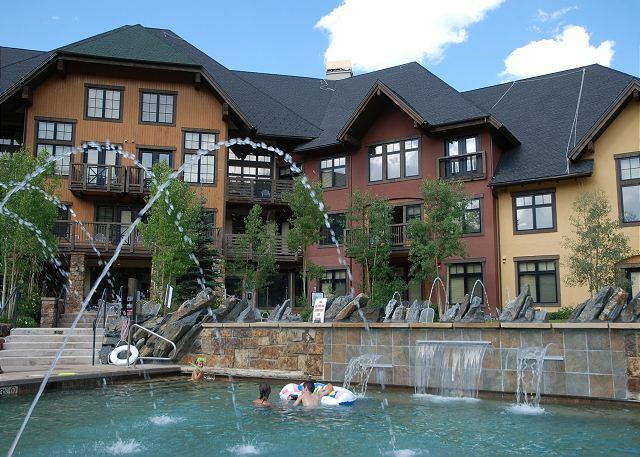 The Outlets at Silverthorne offer over 100 outlet stores in 3 villages. Conveniently located off I-70 at Exit 205 in Silverthorne. Free courtesy shuttle & frequent sales events. Explore Copper Mountain - for Free! Get to know your new favorite mountain destination! 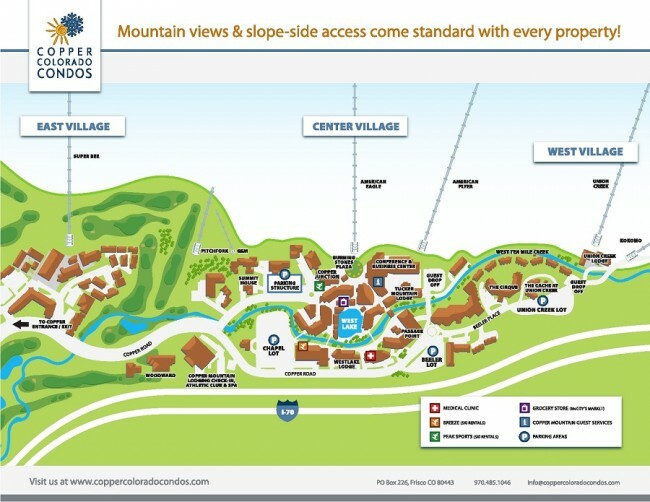 Copper Mountain Resort offers a number of ways for guests to learn about and explore the mountain - for free! Mountain Orientation Tours allow you to "meet the mountain" while a knowledgeable Resort Ambassador shares fun facts. Offered twice daily at 10am and 1pm. Ambassador Snowshoe Tours highlight the beauty of our snow-covered mountain paradise. Offered twice daily at 10am and 1pm. Snowcat Access on Tucker Mountain allows you to have a backcountry experience while safely in-bounds. C. B. Grille in Passage Point. 970-968-3113. Upscale dinner. Good happy hour. Camp Hale in Copper Sports. 970-968-2318 x45625. Coffee shop. Mountain Melts in the Burning Stones Plaza. 970-968-2318. Specializing in made-to-order, sautéed mac n cheese and grilled cheese sandwiches. The Ten Mile in Mountain Plaza. 970-968-3070. Lunch and dinner. Sandwiches, salads, burgers, TV’s. Gustino's Lakeside Pizzeria on West Lake. 970-968-3222. Authentic New York style pizza and the best Lakeside fries! Incline Bar and Grill in Mill Club. 970-968-0200. Lunch and dinner: Family style and chef specials. Starbucks in Mountain Plaza. 7am to 7pm, 7 days a week. Eagle BBQ in Copper Junction. 970-367-5007. Colorado Style BBQ. Jack’s Slopeside Grill & Bar in Copper One. 970-968-2318 x45720. Breakfast, lunch, apres. Jill's Umbrella Bar patio bar at Copper One. Casa Sanchez in Village Square. 970-968-2081. Authentic Mexican cuisine. Storm King Lounge in Mill Club. Sushi bar. Sugar Lips mini donuts next to West Lake. 970-968-2520. Serving mini-donuts, coffee, smoothies. A-Lift Pizza in Snowbridge Square. 970-968-2033. American and Italian cuisine. Lunch and dinner. JJ’s Rocky Mountain Tavern in Copper Station. 970-968-3062. Summer: Lunch only. Winter: Lunch and dinner. Camp Hale in Copper Station. Coffee shop. Double Diamond in Fox Pine Inn. 970-968-2880. Lunch and dinner. Family style and chef specials. Grand Hall Cafe in Copper Station. 970-968-2318 x20203. Lunch only, Cafeteria style. Camp Hale in Union Creek. Coffee shop. Union Creek Cafe in Union Creek. Solitude Cafe & Grill at the top of the American Eagle lift. Flyer's Soup Shack at the top of the American Flyer lift. Open daily starting Dec. 9th. Camp Hale at Solitude Cafe. Coffee shop. Frisco Prime, 20 Main St, Frisco. 970-668-5900. Steakhouse & saloon in a historic cabin. Log Cabin Café, 121 Main St, Frisco. 970-668-3947. Home cooked breakfast, quick lunch to go. The Lost Cajun, 204 Main St, Frisco. 970-668-4352. Genuine Louisiana Cajun food. Moosejaw, 208 Main St, Frisco. 970-668-3931. Local burger joint and watering "hole-in-the-wall"
Deli Belly’s, 275 Main St, Frisco. 970-668-9255. Subs, soups, salads and hot dogs. Pete’s Good Eats, (Summer only) Corner of 3rd Ave & Main St, Frisco. 970-485-0186. On-the-go snacks. Rocky Mtn Coffee Roasters, 285 Main St, Frisco. 970-668-3470. Coffee and soft serve ice cream. The Uptown, 304 Main St. Frisco. 970-668-4728. Contemporary American including Mediterranean, southwestern, and Pacific Rim influences. Fresh wood-oven baked pizza, brunch every Sunday at 10am. The Breakfast Deli, 310 Main St, Frisco. 970-668-9484. Made to order breakfast on the go. Grecco's Pastaria, 311 Main St, Frisco. 970-668-5442. Casual Italian cuisine. Best happy hour in Frisco. Prost Beer & Sausages, 313 Main St, Frisco. 970-668-3688. Beer and sausages in a cozy beer hall. Bagali’s, 320 Main St, Frisco. 970-668-0601. Restaurant and wine bar featuring pastas, pizzas and salads. Vinny’s, 310 Main St. Frisco. 970-668-0340. Contemporary world and vegetarian cuisine. The Tea Bar, (at the Next Page Bookstore) 409 Main St, Frisco. 970-668-9291. Tea, wine and desserts. Butterhorn Bakery & Café, 408 Main St, Frisco. 970-668-3997. Breakfast, lunch and fresh desserts. 5th Avenue Grille, 423 Main St, Frisco. 970-668-3733. American contemporary cuisine. Silverheels Bar & Grill, 603 Main St, Frisco. 970-668-0345. Steak and trout with a southwestern twist. Kemosabe Sushi Bar, 605 Main St, Frisco. 970-668-2100. Sashimi and western-influenced rolls. Great happy hour. Peppinos Pizza & Subs, 610 Main St, Frisco. 970-668-5128. Fresh pizza, subs, calzones and more. Best pizza in town. Ollies Pub & Grub, 620 Main St, Frisco. 970-668-0744. Family friendly with arcade, TVs and live entertainment. Abbey’s Gourmet Coffee, 720 Main St, Frisco. 970-668-8710. Coffee shop offering ice cream, baked goods and smoothies. Backcountry Brewery, 720 Main St, Frisco. Corner of Main and Summit Blvd. 970-668-2337. Brew pub and grill with beautiful views. Frisco Wine and Spirits – wine tastings. The Island Grill at Frisco Bay Marina, (Summer only) 902 East Main St, Frisco. 970-668-9999. Casual island-style fare, frosty tropical drinks, great views from upstairs deck. Frisco Summit Blvd– from I-70 to Main Street. Sporting News Grill, 1129 N Summit Blvd, Holiday Inn, Frisco. 970-668-1234. Sports bar and restaurant. KFC, 1000 Lakepoint Dr, Frisco. 970-668-3568. Fast food. Wendys, 940 North Ten Mile Dr, Frisco. 970-668-0152. Fast food. Taco Bell, 865 Summit Blvd, Frisco. 970-668-5029. Mexican fast food. Subway, 916 Summit Blvd, Frisco. 970-668-3888. Fast food/deli sandwiches. Q4U Barbeque, 857 Summit Blvd, Frisco. 970-668-1775. Full menu of BBQ for dine-in and take-out. Starbucks (in Safeway) – coffee. Hacienda Real, 842 North Summit Blvd, #31. 970-668-9956. Family-owned Mexican restaurant. Lots of food for the price! China Schezwan, 842 North Summit Blvd, #27, Frisco. 970-668-0666. Traditional Chinese for dine-in or take-out. Food Hedz, 842 Summit Blvd #19 btw Wal-Mart & Safeway. 970-668-2000. (Lunch only) International quality cuisine in a casual setting. Smiling Moose Deli, 842 Summit Blvd. #17, Frisco. 970-668-3420. Sandwiches, soup, wraps, salads and breakfast. Carlos Miguels, 740 North summit Blvd, Frisco. 970-668-4900. Authentic Mexican cuisine. Starbucks, 940 Summit Blvd, Frisco. 970-668-4775. Coffee. Sunshine Cafe, 250 Summit Place shopping Center, Silverthorne. 970-468-6663. Voted best breakfast, brunch and lunch. Open 7am - 3pm everyday. The Mint, 347 Blue River Parkway, Silverthorne. 970-468-5247. A historic steak and seafood joint. You choose your steak and flame-broil it on a seasoned lava rock grill. The Hearthstone, 130 S Ridge St, Breckenridge. 970-453-1148. Steaks, fresh seafood and game. Ski Tip Lodge, 764 Montezuma Rd, Keystone. 970-496-4202. Rotating four-course dinner menu. Copper Mountain and Frisco are over 9100 feet. The majority of visitors will have no problem with the altitude. However, if you are traveling from sea level, it's wise to follow some high altitude guidelines in order to enjoy your vacation. Spend at least a day acclimating. Easing into your vacation will improve your chances of avoiding high altitude issues. Avoid maximum physical exertion for the first 1-2 days. Stay hydrated with water and sports drinks. Because of the low humidity in Colorado's mountain environment it is very easy to become dehydrated. Use humidifiers in sleeping areas. Limit alcohol and caffeinated beverages. Keep in mind that one alcoholic beverage at altitude has the effect of three at sea level. Eat small, low fat, high carbohydrate meals. Limit time in hot tubs and sauna. Please visit our Helpful Links page for even more information. Don't hesitate to Contact Us Now if we've missed something or if you have a question or two! We rented Copper Junction 401 and it was a great place to stay. It is close to everything. The lift is out the side door (you can take the stairs or elevator) , there is a pizza place and ski rental shop in the building too. You can see the torch parade and fireworks in the warmth of the condo, as well as other happenings in the main area of the village. The bus stop is out the back door if you need to use the bus and the parking is under the building. We have four adult children and our girls took over the loft and our boys the upstairs bedroom leaving the downstairs bedroom to me and my husband...very quiet and a nice big king bed. Leigh, the manager, is very prompt in answering questions and helping with discounts.